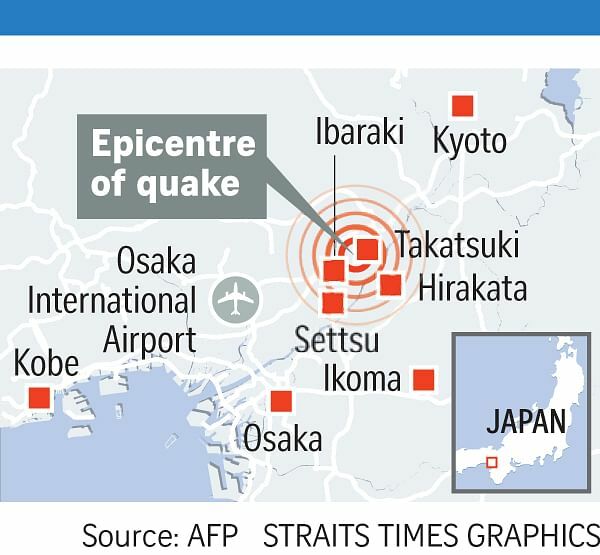 Everything came to a halt as a strong earthquake rattled Osaka yesterday morning, toppling walls, bursting water pipes and sparking rush-hour transport chaos. It left four people dead - a nine-year-old girl, and two men and a woman in their 80s - and at least 350 others injured. The tremor, which the Japan Meteorological Agency (JMA) said was at magnitude 6.1 at a relatively shallow depth of 13km, shook the western Japan prefecture at 7.58am local time (6.58am in Singapore). The inland quake did not trigger any tsunami warning. The Osaka region, which is Japan's second-biggest metropolitan area after Greater Tokyo, is a major industrial hub and tourist hot spot in western Japan. The city is set to host the Group of 20 (G-20) leaders' summit in June next year. The epicentre of the temblor was near the residential Takatsuki district, about an hour to the north of the main tourist area of Dotonbori. The quake shattered windows, brought down walls and damaged cultural treasures such as a 16th-century tea house in neighbouring Kyoto. Several areas were flooded by water gushing out of burst water mains, while news pictures also showed felled signs at a train station, and shops in disarray with products thrown off their shelves. The JMA has warned that aftershocks of a similar magnitude may occur over the next week. In 2016 in Kumamoto, a magnitude 6.2 earthquake was followed two days later by a magnitude 7.0 tremor, which caused even more damage and deaths than the first tremblor. Yesterday's quake brought local train and subway services to a standstill, while the Shinkansen bullet train services that connect Osaka and Tokyo were halted for about five hours, resuming operations only at about 1pm. More than 170,000 homes were hit by blackouts, while gas supply to some 110,000 homes was cut. Power was restored within two hours, but piped gas supply will resume in eight to 12 days, according to Osaka Gas Co.
Several attractions at Universal Studios Japan in Osaka were shut briefly, while Daimaru Matsuzakaya Department Stores closed at least two of its malls. No abnormalities were detected in the region's nuclear reactors, said Kansai Electric Power Co.
JXTG Nippon Oil and Energy Corp shut all its refining units and halted product shipments at its Osaka refinery, which has a capacity of 115,000 barrels a day, before operations resumed in the afternoon. Companies including carmakers Honda, Mitsubishi and Toyota unit Daihatsu, electronics giant Panasonic, cosmetics maker Shiseido, brewery Asahi Group Holdings, and air-conditioner maker Daikin also suspended operations at their plants briefly for safety checks. The United States Geological Survey (USGS) measured the tremor at magnitude 5.3, at a depth of 15.4km. The JMA put its preliminary magnitude at 5.9 at a depth of 10km, which it later revised to magnitude 6.1 at a depth of 13km. The tremor registered a six-minus on the seven-point Japanese shindo scale, which measures earthquakes by their impact on the public and not by geology. A reading of six-minus means that most will find it difficult to remain standing. This was the strongest reading that has been registered in Osaka prefecture since records started being kept in 1923. Japanese Prime Minister Shinzo Abe said that his government will do its utmost to ensure emergency measures are in place, and will continue to work to restore public transportation and gas services. Assistant Professor Wei Shengji of Nanyang Technological University's Earth Observatory of Singapore told The Straits Times that the earthquake "occurred in the same strike-slip fault system" as the 1995 earthquake in neighbouring Kobe, where a magnitude 6.9 earthquake killed nearly 6,500 people. "It is, therefore, not unexpected for an earthquake to happen in a fault system that is currently active," he said.